Skin and bones and ready for the bone and skin trade? It is becoming increasingly obvious that what we all campaigned for - a cessation of canned lion hunting - is now paying dividends. Meaning that cub petting promoters are receiving less clients, that volunteer organizations are now not sending their innocent but well-paying people to South African lion breeding organizations, and that the canned lion breeders are now experiencing financial difficulties. 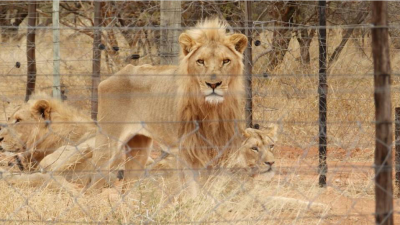 The reality now is that we have to manage the price of success - many of the 8,000 or so lions bred to provide gun fodder are now in a limbo. After all, what we fought for was the defeat of a sordid industry, and we must now accept that we will now enter a difficult phase because of our achievements. 2. Redouble our efforts to make sure no further lions are bred into this nightmare scenario. But then, via public revulsion, the profits and acceptance ended, and that is a great achievement. Now we must all find a way forward to apply pressure to minimise the suffering of the lions already caught in this sordid industry. There are no easy answers here but stopping any further captive breeding into this industry has to be the first objective.